Spread the word — San Jose State University Expungement Sessions this Fall! The San Jose State University (SJSU) Record Clearance Project has scheduled 2 free SPEED SCREENING sessions to review individuals’ RAP sheets this Fall in San Jose, CA! If you or others you know are interested in dismissing past convictions from their criminal record, these sessions will be enormously useful!! Please spread the word to all friends, family, community members, and networks. 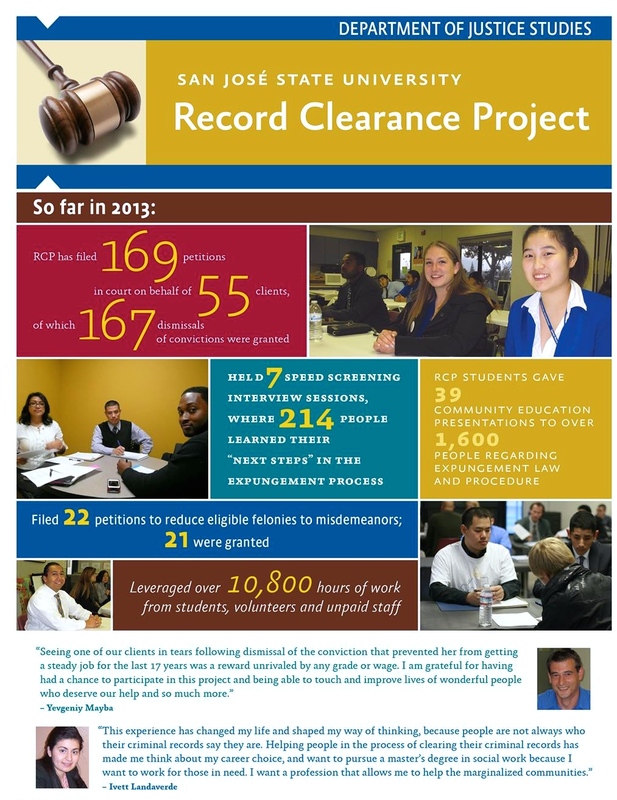 The Record Clearance Project’s Speed Screening sessions will include a one-on-one interview that will help individuals determine their next steps toward record clearing & expungement. If you would like to sign up, please email expunge@sjsu.edu or leave a message at phone number (408) 924-2758 at least one week in advance of the session. You must also bring your RAP sheet with you to the session (instructions for getting your STATEWIDE “rap” sheet can be found at the bottom of this post). Tuesday, October 28 from 3:30 – 5:30pm at Marantha Christian Center, 1811 S. 7th Street, San Jose. Thursday, November 20 from 3:30 – 5:30pm at McKinley Neighborhood Center (behind the school), 651 Macredes, San Jose. Have a happy holiday weekend everyone! FOR CALIFORNIA RESIDENTS–To get a copy of your statewide RAP sheet (showing all convictions in California) from the CA Department of Justice (DOJ), follow the steps below. STEP 1: Decide if you are eligible for a fee waiver. If you are not eligible, skip to STEP 2 below. Info about fees: To obtain a statewide RAP sheet, you must pay the $25 fee charged by the CA DOJ AND the fee charged by the Live Scan fingerprinting provider (usually $15-$25), for a total of up to $50. HOWEVER, if you are currently receiving public assistance (including food stamps, SSI, unemployment, etc. ), you can request a waiver of the $25 fee from the CA DOJ (but you still have to pay the fee for fingerprinting to the Live Scan provider). The CA DOJ website doesn’t tell you this, so we included instructions below! (3) attached proof of your public assistance (for example, a letter from SSI stating the monthly amount of money that you receive). You can send these materials by fax or mail to the CA DOJ. 4. If your fee waiver is approved, the DOJ will send you a pre-printed “Request for Live Scan” form. After you receive the preprinted form in the mail, follow STEP 2 (below) for the instructions on how to fill out the preprinted form and send it in–completed–to the CA DOJ. Fill out the “Request for Live Scan” form (Form BCIA 8016RR). For those who were not eligible for the fee waiver, the form is available online HERE. Fill out all your personal information. Take the completed “Request for Live Scan” form to any Live Scan site for electronic fingerprinting services. For a list of Live Scan locations near you CLICK HERE, and enter your address to see what’s nearby. You will receive your RAP sheet in the mail in a couple weeks! For detailed instructions and links to the forms, see the CA Department of Justice website HERE. KALW RENTRY SERIES RECAP: Root & Rebound is on the air! As you know, San Francisco’s local public radio station 91.7 KALW (part of the NPR digital network) recently ran an incredible three-part series on reentry, featuring Root & Rebound’s very own Executive Director, Katherine Katcher! *Please note that the names of formerly incarcerated men and their families have been changed to protect their identities. Root & Rebound is immensely proud to have contributed to this radio series on reentry. We are thankful to KALW for hosting, and to reporter & producer Luisa Beck for raising awareness about the stories, barriers, and needs of people in reentry. This series highlights a few of the millions of voices that drive Root & Rebound’s legal advocacy in the Bay Area, throughout California, and beyond. We encourage you to share the series with your friends, colleagues, family, social media networks, and others interested in supporting second chances. If you’d like to contribute to Root & Rebound’s work, donate and become a Founding Donor today! FINAL part of 3-part series feat. Root & Rebound on SF Public Radio Station KALW 97.1 FM today! Root & Rebound is ON THE AIR!!! The FINAL part of an INCREDIBLE 3-part public radio series on reentry aired yesterday on local San Francisco radio station 91.7FM KALW (part of the NPR digital network), featuring our very own Founder & Executive Director, Katherine Katcher! Huge props & gratitude to Luisa Beck, the producer and reporter on the series. Stream the series online here. These are stories that EVERY person should listen to! Please share widely with your friends, family and networks. Note: The names of formerly incarcerated men and their families in this story have been changed to protect their identities. It’s a long drive from Oakland to the Deuel Vocational Institution, a prison in Tracy, California. For Brianna Bennett, growing up, that meant she rarely saw her father, William. He had never picked her up from school or gone with her to a movie. In fact, they had never stepped outside of the prison gates together. More than 2.7 million minors in America live with a parent in prison. Studies show that the majority of incarcerated parents reside over 100 miles away from the home they occupied before arrest. That makes visits time consuming, expensive, and difficult to coordinate. In 1991, Brianna Bennett was born while her father was locked away. When she was only about a year old, he got caught selling drugs in prison. After his drug tests came back positive, he was denied contact visits. Katherine Katcher, executive director of Root & Rebound, a reentry advocacy center in Berkeley, says that for a lot of people in prison, family can be extremely motivating. “So just like getting a job is extremely important to a lot of people, and the reason why they’ll get out of bed every day, for some people the chance to see and reunite with their children or another member of their family is what motivated them to work so hard in prison and to get out,” she says. Bennett describes that moment when he saw his daughter behind glass as a major turning point in his life. When he started attending Narcotics Anonymous, or NA, meetings, things really started to change for him. “I heard my story in there. Each time I go, I’d get something and take it. ‘Ooh, yeah, I can identify with that! Oh, I can feel that too, I can understand that,’” he says. The fourth step of the NA program required Bennett to write a short story about his life. He wrote about his father. 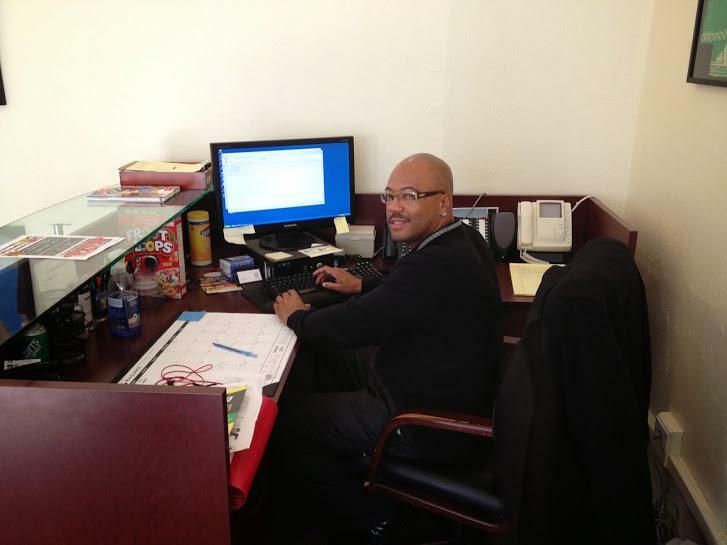 Bennett started attending college programs in prison, volunteering with nonprofits and earning work certificates. He realized he could do a lot to improve his life and his chances of getting out. But when it came to being a father, he had less control. He and Brianna’s mother divorced when she was around five years old. Bennett barely saw his daughter after the divorce. Over half of incarcerated parents don’t receive any personal visits from their children. When there’s little to no contact between incarcerated parents and their children, it becomes much harder to establish a relationship later on. Bennett tried to maintain and strengthen his relationship with Brianna through letters. I ask her if she liked receiving the letters. One day, Bennett came home after spending 31 years in prison. Brianna Bennett says building a relationship takes time. Katherine Katcher doesn’t think that family reunification is appropriate for every single person in every case. But she says the potential benefits of reunification are huge. Today, William Bennett is going to school to get his bachelor’s degree. He’s also working full-time and trying to be a supportive parent and role model for his daughter. 2nd part of 3-part series feat. Root & Rebound on SF Public Radio Station KALW 97.1 FM today! 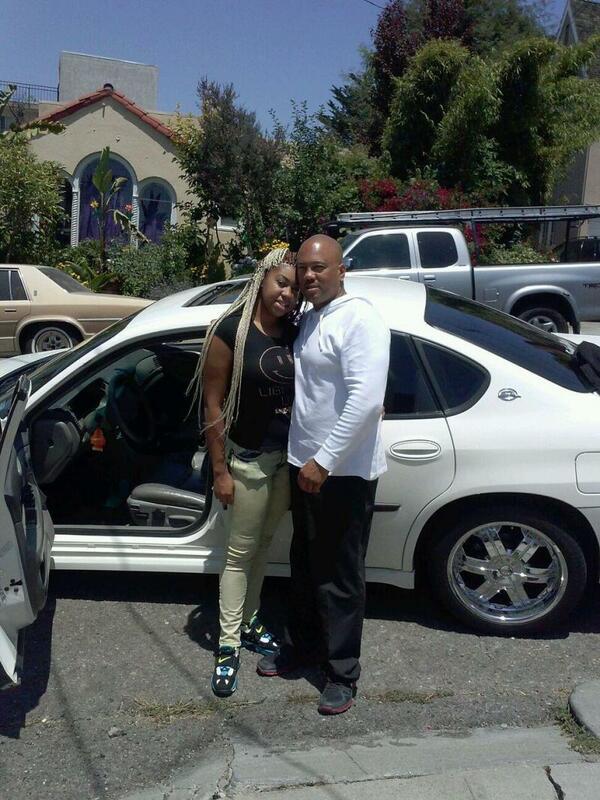 The SECOND part of an INCREDIBLE 3-part public radio series on reentry aired yesterday on local San Francisco radio station 91.7FM KALW (part of the NPR digital network). The series has so far featured our very own Founder & Executive Director, Katherine Katcher and KALW also did a piece on Alton McSween (Coach) at the California Reentry Institute, a former lifer, who is a great friend and huge inspiration to the entire Root & Rebound team. We wrote about Coach’s story back in October 2013, when Root & Rebound was just starting out and we’re so pleased to see his work showcased. Again, many thanks go to Luisa Beck as well as Ben Trefny and Ashleyanne Krigbaum along with the whole KALW Crosscurrents team for making this important series possible. If you are in the San Francisco-Bay Area, tune into KALW 91.7 FM on Wednesday, August 20, at 5:00 pm for the FINAL part of this series! Or stream it online here. These are stories EVERY person should listen to! A note to our readers: the names of formerly incarcerated men and their families in this story have been changed to protect their identities. At the age of 51, William Bennett was one of the oldest people in California who could claim that. But in June 2013, eight months after leaving prison, that was about to change. He enrolled in the Golden State Works Initiative, which provides job training and placement services to parolees in Oakland. On the last day of his training, Bennett and I met for breakfast. I asked him to tell me the most challenging part of reentering. Bennett introduced me to many parolees who had similar questions and fears. People like John Porter. Porter and I met in April at the Berkeley Rose Garden. Like Bennett, Porter had taken part in the GSW job training program. But he was having trouble finding work that paid a living wage. “Because if it’s not anywhere between $19 to $25, you know, it’s really hard to live because you’re just going to be working to pay your rent,” he said. According to a 2010 study, serving time reduces annual earnings by 40 percent on average. Nearly one in three working-age Americans has some kind of criminal record. About half don’t find jobs the first year out. Some local governments have made it illegal for city contractors to ask an applicant about their criminal record on an interview form. But current state and federal law allows potential employers to reject formerly incarcerated people. Katcher says it can happen at any point. Porter told me he’d recently been turned down from his old job as a school bus mechanic because of the felony on his record. He was getting frustrated. “I’ve been applying at AC Transit, the Port of Oakland, Muni, the city of San Francisco, the city of Oakland. You know I’ve been applying everywhere trying to get a decent job,” he said. While waiting to hear back, Porter was working several part-time jobs. As a mover, an installer, a welder, and a part-time ceramics instructor. 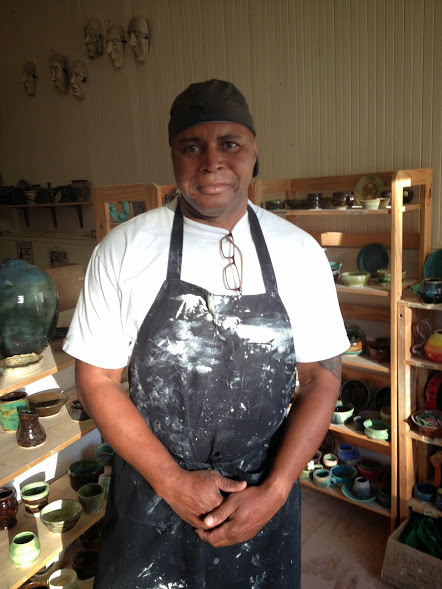 He’d also started making pottery in a prison arts program. In May, we met up at Creations in Clay, a ceramics studio in Oakland. He showed me bright tall vases with blue, orange, and mother-of-pearl glazes displayed in the studio’s small gallery. 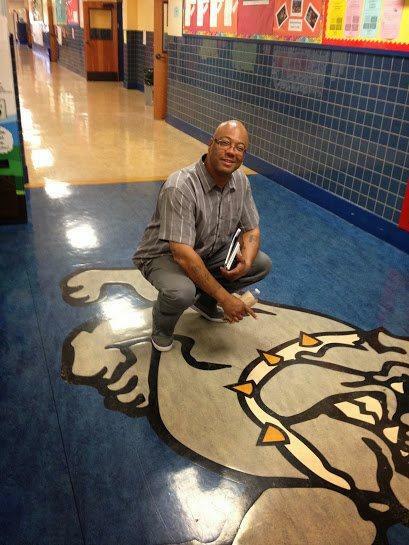 This was one place where he was not judged for his past but admired for his skill as a teacher and artist. The job, however, did not paid enough money to live on. Like Porter, Bennett worked part-time jobs while looking for permanent work. He worked two to three jobs that paid minimum wage or up to $10 per hour. Some days, he drove a truck from 3pm to 5am. On other days he transported cars for a car rental company, washed uniforms and rugs for an industrial cleaner, and worked as a security guard at night clubs. But he kept networking – talking with contacts and handing out business cards. One day, he told his story at a fundraising event and impressed the Chief Executive Director of Westside Community Services, a mental health agency in San Francisco. He got hired, and started as a receptionist. The job turned out to have surprising challenges. In prison, Bennett had no access to the Internet. So things like searching for online information, managing passwords, and using smart phones were completely new to him. Studies show that many formerly incarcerated people have significant educational and employment deficits. Roughly half lack a high school degree and many depended on illegal income prior to incarceration. When they get out, they have a lot of catching up to do. To reveal or hide the past? Eventually, Bennett transitioned into a role as a community liaison. Part of his new role included reaching out to local parents and youth. We drove to Wallenberg Traditional High School in San Francisco. Bennett came here to speak to a group of students about his experiences growing up and in prison. About 20 students and their teacher, Kachiside Madu, gathered in the school library for their last ‘men’s group’ meeting of the year. The room became quiet when Bennett began his speech. Bennett has found a job that lets him pay his bills and tell his story. Porter hasn’t been so fortunate. He decided to stop telling potential employers about his criminal history. Now, he says, he’s close to landing a job as a full-time driver – not what he wants to do, but better than nothing. Yet he’s anxious a background check could end his employment at any time. Root & Rebound on SF Public Radio Station KALW 97.1 FM today! An INCREDIBLE 3-part public radio series on reentry began yesterday on local San Francisco radio station 91.7FM KALW (part of the NPR digital network), featuring our very own Founder & Executive Director, Katherine Katcher! Huge props & gratitude to Luisa Beck, the producer and reporter on the series. If you are in the San Francisco-Bay Area, tune into KALW 91.7 FM on Wednesday, August 13, at 5:00 pm for Part 2 of this series! Or stream it online here. This is a story EVERY person should listen to! It’s hard to tell how old William Bennett and his friend John Porter are based on looks. Bennett is about six feet tall, wears a silver ear stud, and has a signature cologne: Gypsy Musk. Porter is a little shorter. He has big eyes, a small gap in his upper teeth, and a huge friendly grin. Both of them have a determined and yet playful air about them. When they show me the kitchen they share with 12 other guys, they start the kind of banter that only two trusted friends can get away with. “Do you both cook sometimes here together here in this kitchen?” I ask. “So who’s the better cook out of both of you?” I ask. “Me, I am,” says Bennett. “No, I am,” says Bennett. “I’m the better cook, because I used to cook for everybody in the penitentiary. I came out here, and I cook for everybody out here. He’s not telling the truth, I always cook,” says Porter. Bennett and Porter do their cooking in a shared kitchen that’s part of a transitional house in West Oakland. But they met many years ago. “Well, we were actually in prison together,” says Bennett. “We did about twenty years together,” says Porter. Porter and Bennett went to prison for murder. Each was on drugs at the time that he shot a person. Porter served 27 years in state prison. Bennett served 31. “I got out November 1, 2012,” says Bennett. “I got out February 21, 2013. And I put in to go to the Options Program,” says Porter. Options Recovery Services provides clean and sober housing for people who are either recovering from substance abuse or re-entering society from prison. The program has 10 houses in Oakland and Berkeley. Bennett and Porter’s house in West Oakland looks a lot like all the other family-style houses in the neighborhood. It’s got a front porch, white wooden panels, and a stairway leading up to the entrance. It’s hard to tell from the outside that at any point in time, 14 to 20 men live here. I ask Bennett what he thinks of sharing a room with someone else. The men give me a tour of the house, which is tidy and yet crowded. A chore list with over a dozen names hangs in the kitchen, and the computer, chairs, and piano in the living room are all shared. While Porter and Bennett appreciate having a roof over their heads at Options Transitional Housing, they do share a criticism of the program. Dr. Davida Coady, the executive director of Options, disagrees with Bennett. Coady started Options 16 years ago because, at the time, there were no services available to people with little money who were suffering from addiction. A lot of former lifers choose Options over other programs, because it’s one of the few places that will accept them even before they get out prison. She says that many of the people who’ve been in prison for a long time don’t have contacts on the outside or family to go to. “Many of our people come from families where there’s a lot addiction and going back there is not going to work for them,” she says. People coming out of prison often have very little support for basic needs like housing. Katcher says that the few programs that do get funding tend to focus on substance abuse. “But what happens is that the men and women that will apply to that and get into those programs don’t belong there,” she says. “It’s an inappropriate place for them to be, and they’re taking up space from people who might actually need to be there, but they need a place to live, and they’re not able to go and get jobs or go to school, because they’re in very restrictive housing, because they supposedly have a substance abuse problem,” she says. Some people like Bennett and Porter, who served long prison sentences, already spent decades in drug recovery programs while they were in prison. In 2013, the California Department of Corrections and Rehabilitation, or CDCR, found that people who were sentenced to serve up to a lifetime in prison were six times less likely to return to prison as people who served shorter sentences. And of about 1,000 people who were paroled after serving sentences in California of first- or second-degree murder, zero have committed another murder. Bennett and Porter are both eager to get their own place. But it’s not easy. Many landlords require rental or credit histories, which someone who has spent most of their life in prison cannot show. And housing in the Bay Area is expensive. So the men need to find a steady, well-paying job before they can earn enough money to move. As we walk out of the Options house, Bennett tells me how much he wants to have his own apartment. “I can save a lot of money there, but it’s time to move on,” he says. A few months later, I check in with the guys to see how they’re doing. Bennett has moved on from Options. He’s found steady work and an affordable studio apartment in San Leandro. I go to visit him at his new place. “Why, you’re the first one that ever came here,” says Bennett. “Can you give me a tour?” I ask. We go into his kitchen. Bennett has many, many Oakland Raiders cups. “Twelve more and about 20 more in the cabinet,” he says. “Can you describe to me what it’s been like living in your own place? Because is this the first time you’re living by yourself?” I ask. Bennett tells me that having his own space is one of the best parts of leaving prison and Options Transitional Housing. He contrasts his new living space to prison. Porter is still living at Options. Unlike his friend, he has not been able to find a job that pays enough for him to afford his own place. Options recently moved him to a different apartment in Oakland. We meet at a nearby park, where he describes it to me. Limited housing options are a huge hurdle for people who leave prison. Section 8, for example, bans people with certain types of offenses from living in public housing. And private landlords are permitted under law to discriminate against people on the basis of their criminal records, as long as it doesn’t violate other civil rights laws. Until there are more housing programs for people re-entering, they will have to do the best they can with what’s available. Don’t forget to tune in on Wednesday, August 13, at 5:00 pm for Part 2 of this series! Or stream it online here. Root & Rebound: Join us at two Reentry Events this Fall! Michelle Alexander, civil rights attorney, advocate, and legal scholar. Keynote Speaker at the 2014 ‘Shaking the Foundations’ Conference at Stanford Law School. Happy Friday! Today, we wanted to share information about two reentry events that Root & Rebound is co-hosting this Fall. We encourage you to join us there! Saturday, September 27 2014: Root & Rebound is co-hosting a Reentry Event and Resource Fair for San Francisco and San Mateo Counties in collaboration with the Archdiocese of San Francisco, PICO and Californians for Safety and Justice. This FREE event is for returning individuals, their families, their advocates, community partners. Really, it is meant for anyone interested in learning more about reentry services in SF and SM counties, hearing speakers at 6 panels talk about issues in reentry, and understanding more about the Safe Neighborhoods Act, which will be highlighted at the event (and on the SF Ballot in November). Reentry organizations ins SF and SM counties are encouraged to sign up to table at the resource fair – to showcase their services. Please see the ReEntry Conference & Resource Fair flyer for more information. Join Us! Friday & Saturday, October 17-18 2014: Root & Rebound is designing and presenting a panel on reentry law, made up of influential lawyers from across the country, at Stanford Law School’s annual ‘Shaking the Foundations’ conference. 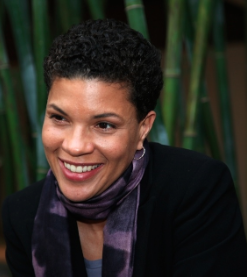 Michelle Alexander, an inspirational figure who speaks powerfully about the movement for achieving racial justice and ending mass incarceration, will be the keynote speaker. She is the author of The New Jim Crow: Mass Incarceration in the Age of Colorblindness, a must-read for anyone who wants to better understand the criminal justice system in America (we wrote about her incredible work and vision in a previous blog post). This event and our panel are designed to inspire a new generation of young attorneys to get involved in these issues. Join Us! Root & Rebound is proud to be partnering with such inspiring and dedicated reentry organizations in California. We hope you will join us in these events either as a participant or an audience member. Please share the news widely with your friends, neighbors, colleagues – Can’t wait to see you there!